A quarter century after he jump-started the gastro pub movement in Australia, chef Damien Pignolet returns to PHMG’s Woollahra Hotel and Bistro Moncur for a special event and commemorative month. On 3 March 1993 the doors first swung open to the innovative new French-style bistro in the Woollahra, quickly becoming a place to be seen and revolutionising pub dining in the 90s. This weekend marking the Silver Anniversary, Pignolet returns (tonight) to host an exclusive sold-out event at the famous pub restaurant, alongside the kitchen’s new generation of innovation, group executive chef Ben Varela, and head chef Mark Williamson. An internationally renowned fine-dining chef, Pignolet bore influence on a succession of rising stars in the kitchen, and a litany of quality restaurants in pubs, which he says complement foodservice with their multiple revenue streams. “They were incredibly heady days,” he recalls. “It was post-recession, there were so many staff available and there was a market eager to see something new, so we timed it perfectly. The celebratory menu comprises four specially-crafted courses featuring classic dishes from the original 1993 Bistro Moncur menu, and will be available for guests throughout the month of March. Signature dishes include: shellfish soup, made of three different shellfish and seven fish, slow-cooked with onion, carrots, tomatoes and saffron; Damien’s Salmon, of salted and cold-marinated salmon, which has been a regular since the very first menu; Bourgeoise confit of duck leg, cooked sous vide for 10 hours rather than in a vat of fat, and finished in the oven; and dessert of buttery crisp pastry, topped with raspberries and topped again with almond flakes poached in butter. Pignolet spends most of his time consulting these days, and espouses the virtues of modern methods such as sous vide in producing high-quality, consistent and eonomical fare in a commercial kitchen. “It is far more cost-effective – everyone’s winning,” he says. 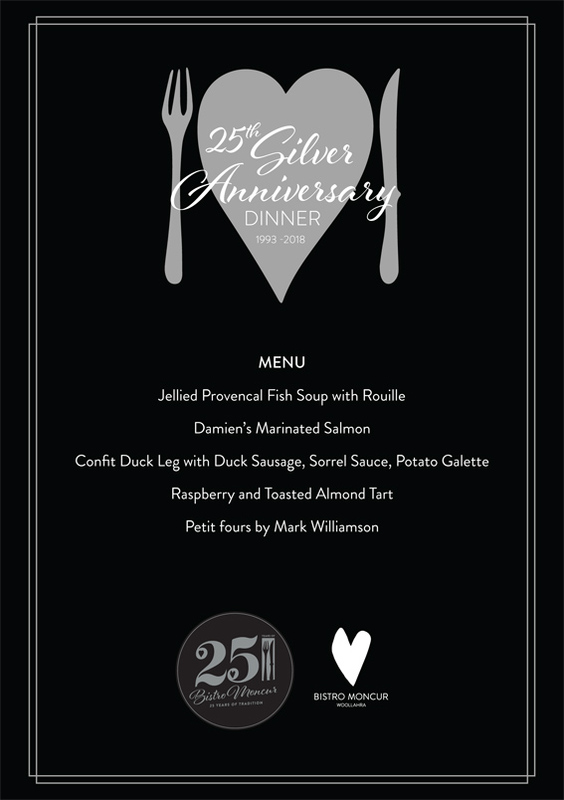 Bistro Moncur’s Silver Anniversary celebration will continue throughout March.